"I’m seeing that there is a madness in guilt, a torment. Matthew 18 talks about it: “If you don’t forgive… you are turned over to the tormentors.”"
The Law of the Spirit isn't a new set of rules or method that you must perform - it's all done for you. 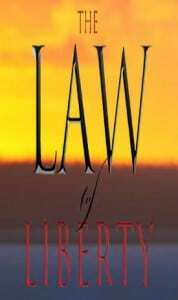 What is this Law of Liberty all about? I was asked a question about my recent devotion, “Your Eternal Destiny Pivots on Surrender,” and I’d like to address it here because it’s a valid one. I spent much time in this passage of Matthew 7, and I came to the conclusion that Jesus was addressing believers. They call Him ‘Lord, Lord’ and they manifested the gifts of the Spirit, which God gives and does not withdraw. The gifts of the Spirit are a real exposure of obedience (Romans 11:29 – For the gifts and calling of God are irrevocable). Also, the kingdom of heaven refers to the reign of God on earth, both now and in the millennium. I believe Jesus is saying that those who “minister” apart from His will cannot enter the kingdom, either now or when the Lord rules the earth. The kingdom is coming under the King, and no one who does not obey can possibly see or experience the kingdom. And that is the real issue of the passage.